Yesterday on local tv about new EU projects, my daughter Cato and her friends were also in it. I scored the most research projects this year in the EU funding round and they wanted to show it in the local news. The filming lasted 4 hours (! ), it culminated in a 1.5 minute piece where I at some point actually said: ‘it’s a men’s environment where I work so it’s nice to know you’re the best’…. ?what was that?! I can’t believe I actually said it.. It was wonderful, I told my story, they laughed, they clapped, I had a great time. Here’s me with Vivienne Ypma (director of the Kleine Komedie theatre), Hans Sibbel (Caberetier and stand up comedian Lebbis), myself and George van Houts (actor and playwright). 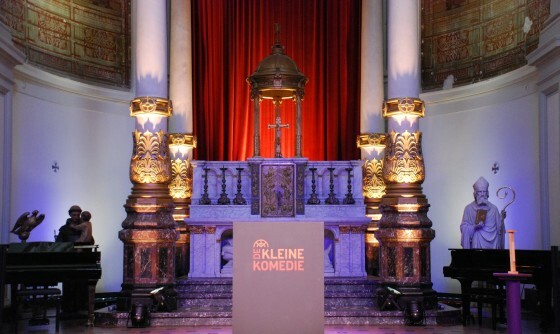 Performing at the Kleine Komedie! At the opening of the theater season, ‘De Kleine Komedie’ (the best theater in the Netherlands if you ask me) opens with short presentations by politicians, comedians, famous people and…for some reason…me! I will talk for 15 minutes about robots in future society..perhaps!